In October 2015, Team McSchwarten launched their intended REVIEW of RRC Procurement processes and establishment of true “Buy Local” program. For those of you who don’t know what the term “procurement” means, it basically means “buying things” or “purchasing”. Bureaucracy lingo aside, what Team McSchwarten is trying to say is they want to make sure council buys local where possible. This then got me thinking. I wonder if Team McLabor, I mean McSchwarten, procured, I mean bought things, from local businesses during their campaign. Let’s call this the McHypocrite test. Using my newest algorithm developed whilst under the influence of Coke and Pizza, I quickly developed an App and installed it on my super dooper eye pad. My pet duck performed some basic alpha testing before putting the system into a real life production environment. Within seconds, the McHypocrite test had completed. Unfortunately the results did not support McSchwarten’s buy local agenda. a) the domain was registered by a company in South East Queensland. c) the website was developed by a company in South East Queensland. 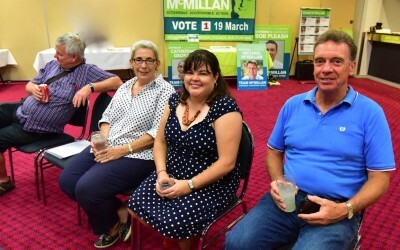 The irony in all this is Team McSchwarten’s campaign manager is the former Minister for Failed Payroll Systems and the former Member for Rockhampton, before retiring right before the Labortanic sunk and converted to a Tarago. So both Mr Schwarten and his mayoral candidate Big Mac, I mean McSchwarten, weren’t aware of any IT providers in the immediate Rockhampton area that could register a domain name, provide web hosting and develop a website. Maybe if they did “think local” and let their fingers do some searching online, they would have found a local Rockhampton provider that even went to the effort of securing the websites uploads folder. Now’ here’s where things get funny. The above oversight isn’t best practices so I took the liberty of emailing team McSchwarten via the advertised email address on their website. To my horror, I received an NDR. Sorry, i’m not trying to sound like a bureaucrat, that’s tech talk for “non delivery report”. In other words, the email bounced. Can you believe it, the McSchwarten team lead by the former Minister for Billion Dollar Payroll systems didn’t even have a mailbox associated to the advertised email address on their website. Not only that, instead of fixing it, they just removed the email address from the header of the website. Oh and whilst searching the exposed uploads folder, I found Stephen Schwarten. This photo obviously wasn’t taken at a council meeting. I wonder what’s blurred in the background. It must be a photo of Stephen Schwarten at council chambers.